We were brought to an ‘Apple Expert’ and a gentleman called Antonio who was standing beside him. We were asked if we wanted some water as we sat down, and we waited for a Specialist to bring the bottles to us. 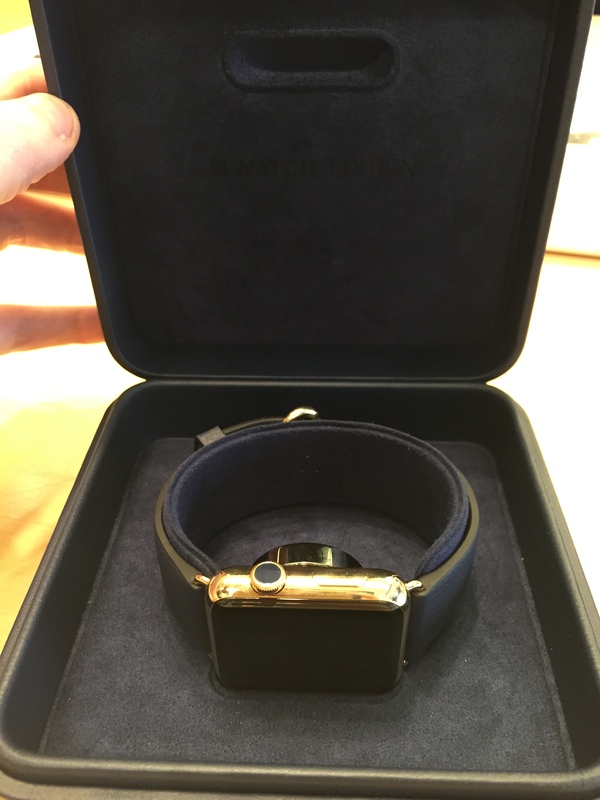 My colleague hadn’t had a try on appointment before, so he wanted to try to 38mm with the Milanese Loop. Soon after trying the Watch with the Link Bracelet, he was convinced. During this, I was talking to Antonio about his Watch. I could see he was wearing the 42mm with Link Bracelet, and he was saying how it helped him arrange his notifications much more easily. He could be in a meeting, and the taptic engine would let him know he has a new message. My iPhone kept buzzing in the meeting earlier, up to 5 times at once, so the temptation to check them grew and grew. He agreed that it was a good way of quickly checking them, dismissing the irrelevant ones, and leaving the others until later. I said while thats useful, the main block is waiting for apps to be updated for the Watch, such as WhatsApp. At the moment, I can view a new message in the groups I’m in, but not reply. The Expert then briefed the security guard that the Watch Edition is on its way. For me, this is when it became something different. 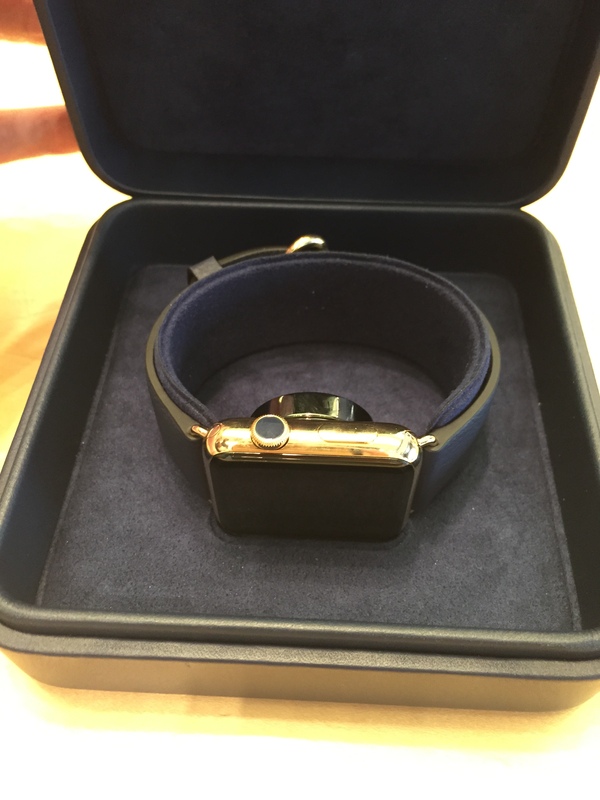 A specialist brought the Watch in a dark blue case, reminiscent of a Rolex one, and once he opened it, there it was. Classic black strap with gold buckle, and the 42mm gold face. What I didn’t know, is that the magnetic charger that comes separately with the other models, is built right into the box. You could take it off, place it into the box, and let it charge overnight. Useful and unique only to the Edition. 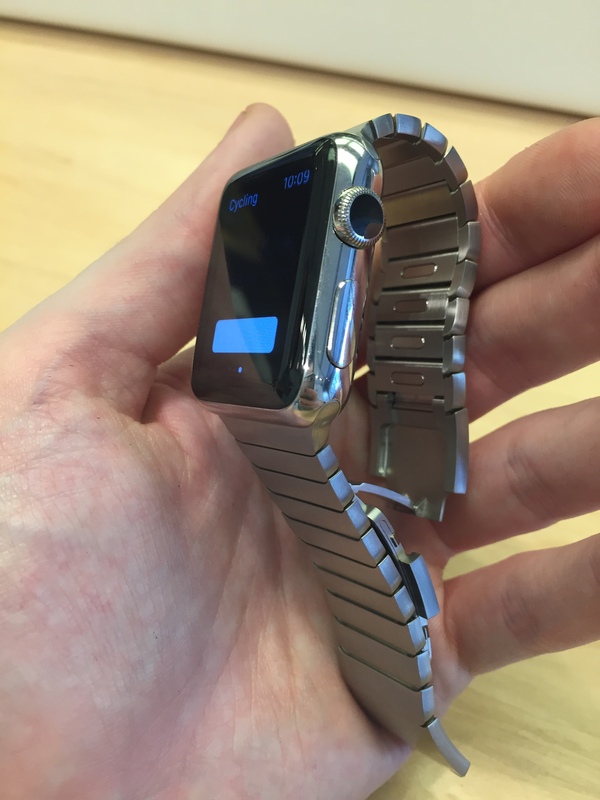 It definitely felt heavier, but every part of it felt more comfortable than the Stainless with Link Bracelet, and as a good Watch should, it didn’t irritate me by pinching the skin, or make me uncomfortable wearing it. Antonio was saying how it looked great, and it definitely did. Also to note, there were people who thought the table was somewhere that you could freely sit down at and try the Watch on without appointment. The security guard corrected these thoughts by telling them it was a ‘private booking’ and turning them away. He stood in the same position the entire time we were there, making sure no one came over, and that again felt strange to me. The Expert was telling us how premiership footballers were trying the Edition on, liking it, but in the end went for the Sport Space Grey model, because it suited them better. When I arrived in London the day before, I made sure I arrived in the morning, just so I could walk around once again. As I said a couple of months ago, walking around London, you’ll never get bored, and you’ll always come across something different that makes you want to stop and watch on. 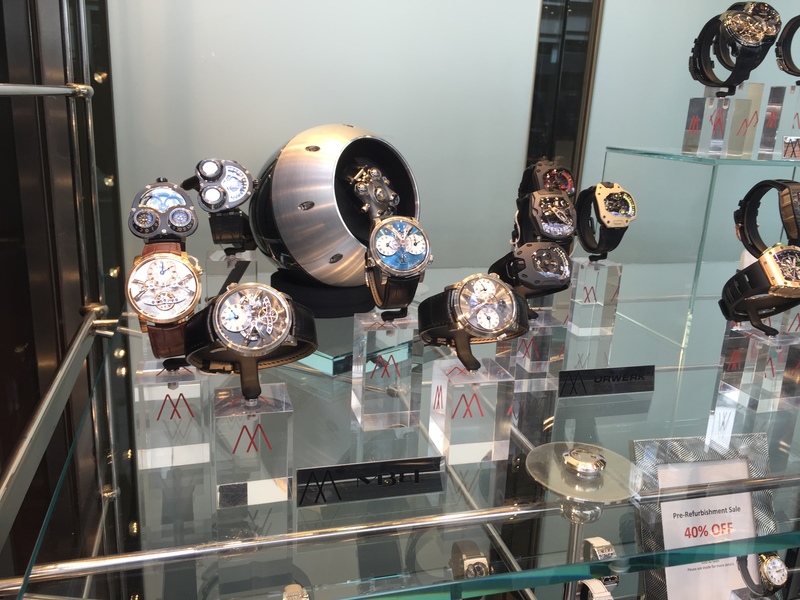 I stopped at this Watch Shop on Bond Street, and they all looked incredible. Each of their hands were turning round in unison, and each were about four thousand pounds, with diamond encrusted straps or faces, or both. But I didn’t feel comfortable to freely step in and try one on. Which is why when I was wearing the Edition, I was thinking; I’m sitting in another place, trying on a watch that was three times the amount of these watches. Then it occurred to me, that this is the start of something. Technology has always been in its own bubble, even as close as ten years ago when people were discovering MSN Messenger, but only now it’s seeping into other avenues. It’s become more open, more approachable, and essentially, inevitable that it’s going to go into more industries. Automation and the home is where I can see it appearing more in the coming years. 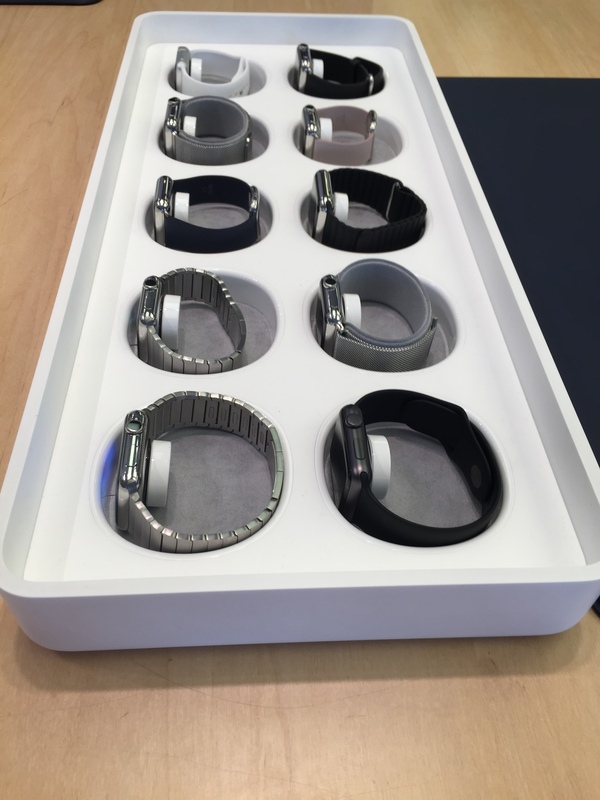 So I think soon, the stigma of not wanting to come into a Watch shop in Bond Street will dissipate, as you’ll soon be able to buy any Apple Watch model (bar the Sport model I imagine, there’ll be limits) and freely wear it, pay it, and walk out while wearing your casual Converse and black t-shirt. After using the Edition for a half hour, I wanted to try on the Link Bracelet after Antonio talking to me about his experience with it. He had to leave, and left us with the Expert. 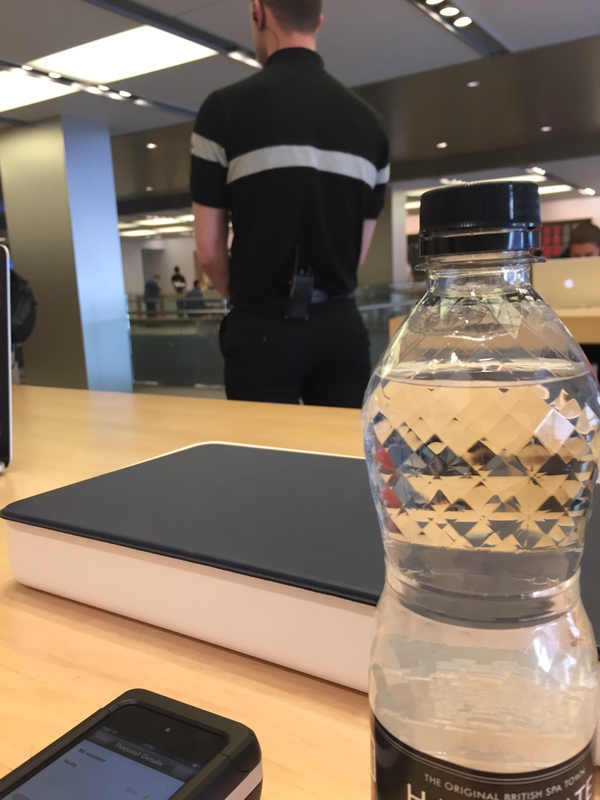 I asked if he was the manager of the store, and, I have to be vague here, the Expert replied that he works at Cupertino, leading a team in a major department for Apple. Naturally, I was instantly kicking myself in not asking who he was in the whole half hour I was talking to him. Otherwise I’d be asking him much more about his role. I’ve got very thin wrists, so I wasn’t sure whether to see if the 42mm was going to be too big. Trying both sizes with the Link Bracelet, the 38mm did seem to fit better, but I’d go with the 42mm. The better battery, and the screen space always helps, especially when reading text. Plus with my eyes getting worse by the month it seems, it will keep me from squinting when I’m quickly checking it as I’m walking through town or the standard British weather. In the end, any smart watch isn’t something you need. You can’t justify it, you can’t explain that it will replace your phone, because it won’t. It’s a ‘fun device’ in the same respect as an Xbox One is. Or a coffee from your favourite hideaway. You’ll want one just because you do, and sometimes you can’t rationalise every single thing to justify it to yourself. It may be expensive in some respects, but it’s a fun device, and it’ll keep you from checking your phone every five minutes, which in this modern age, is a big benefit.